Our POW Polyextra flags are especially designed and meticulously crafted to please our most discriminating customers. Their two-ply polyester fabric is specially loomed and dyed to withstand the most demanding weather conditions, counteract the effects of ultra-violet light, and still remain crisp and bright. 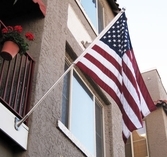 Uncommon USA, Inc., believes in the "highest quality" and "Made In The USA" when it comes to our flags. Our Military Flags that we offer to you have a combination of the highest quality components and state-of-the-art manufacturing to give you the best looking and most durable flags in the industry. The construction begins with the finest fabrics. The assembly of each flag has a full 1/4" turn on all seams, a chain stitch for all horizontal seams (it makes the flag stronger), along with a lock stitch for all edge hems. Fly hems are finished with four rows of lock stitching and reinforce at the top and bottom.